Allergan is recalling one lot of TAYTULLA birth control sample packs. A physician has reported that four placebo capsules were placed out of order; specifically, the first four days of therapy had four non-hormonal placebo capsules instead of active capsules. As a result of this packaging error, oral contraceptive capsules, that are taken out of sequence, may place the user at risk for contraceptive failure and unintended pregnancy. 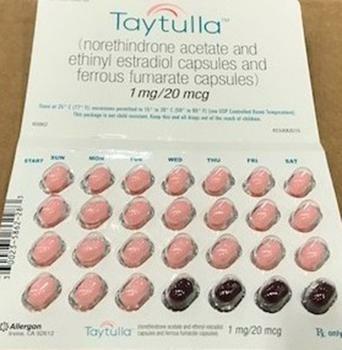 The TAYTULLA pill pack is a 28 count blister card that has 24 “active” pink softgel capsules (with hormones) with “WC” printed on the outer shell in white to be taken for 24 days, followed by 4 maroon softgel capsules (without hormones) also imprinted with “WC” on one side to be taken for the next four days. Allergan is notifying customers by recall letter and is arranging for return of all recalled product. Consumers who have the recalled product should notify their physician to arrange a return. Consumers with questions may contact Allergan (800) 678-1605 8am – 8pm (EST) Monday through Friday.